Times have passed and the way you get hired jobs as software developer or even other positions has changed. In the past you used to find jobs and and apply by sending resumes. Or worse you would get chased by annoying recruiters. Nowadays companies like Hired have inverted the process and made it such way that instead of you applying for jobs, companies apply to find talented professionals. Read this article to learn how Hired implements this modern hiring process and how you can join to benefit from getting better job opportunities. We all know the traditional job search is tedious and outdated. Who hasnt experienced the suffering of sending out countless resumes only to get limited responses from companies youre actually interested in? Worse yet, many of us have lived through that nightmare scenario of dealing with the pushy recruiters constantly chasing after you and trying to squeeze you into interviewing with companies you have nothing in common with. The good news? There is a better way. On Hired the traditional process of finding a job is completely reversed; companies apply to you for the chance to interview, not the other way around. The days of dealing with recruiters and sending your resume out into the ether are gone. 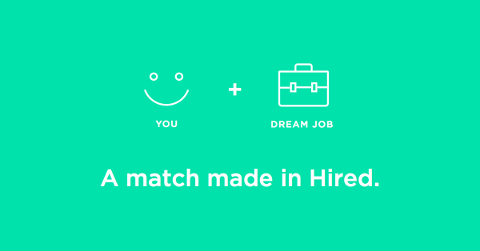 Hired puts the power back in your hands, by allowing you to get exposed to over 4,000 innovative companies, while giving you control over who you end up interviewing with. It can often feel difficult to go through the job search process alone in a silo, while working with recruiters can sometimes feel like theyre looking out for their interest rather than yours. Thats why Hired offers free, unbiased support from dedicated Talent Advocates. Far from recruiters, Talent Advocates are there to help you find the right fit in your next role, through giving information on a companys culture, helping you with negotiation, or just lending an ear to help you think through each offer you get. Its 2016, you deserve transparency in your job search and the tools to be empowered to make the right decision about what opportunities youd like to pursue. Hired provides all that and more, and its totally free to use.